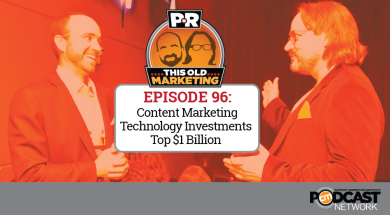 In this week’s post-Content Marketing World episode, Robert and I discuss how venture capital interest in content marketing continues to accelerate with over $1 billion invested to date. Next, we analyze the results of a new study that reveals that only 17% of content marketers have fully documented their customer journeys and explain why this isn’t necessarily a problem. Robert and I also debate the meaning behind BuzzFeed’s new deal with GroupM, and we love Uber’s plan to roll out a print magazine for its customers. 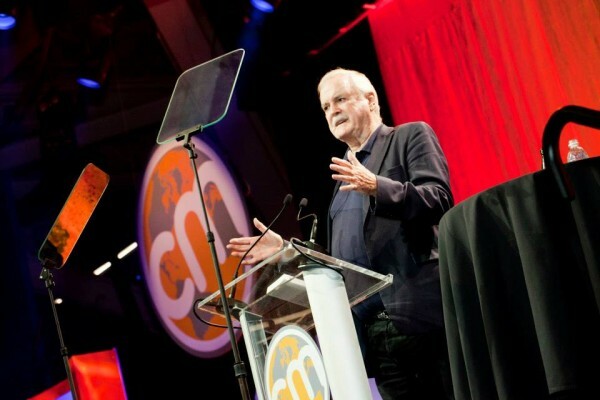 Rants and raves include John Cleese’s mesmerizing creativity speech at Content Marketing World and the way in which Beth Comstock has transformed marketing at General Electric. This week’s #ThisOldMarketing example: The Story of Content: Rise of the New Marketing. Content moves to the middle (5:29): Content marketing has clearly taken center stage for brands, entrepreneurs, and investors. The industry is on track to generate $313 billion in revenue in 2019, according to PQ Media’s Global Content Marketing Forecast. To date, venture capitalists have invested more than $1 billion in content marketing technology start-ups since 2006, according to NewsCred. Robert and I agree that PQ Media’s prediction isn’t accurate, and we share a more realistic number. We also tie in an article by Robert, which explains why ROI is the right metric for content marketing, and a 1977 speech by Steve Jobs, in which he explains how Apple starts with a vision of the ideal customer experience and works backwards from there – an approach that content marketers ought to adopt. Only 17% of brands have the ability to fully analyze the customer journey (17:38): A new Econsultancy report in partnership with Adobe found that companies are still struggling to embrace multichannel marketing. While 42% of respondents say they are currently working on having the capability to analyze the customer journey, 41% say they are either still in the planning stage or have no plans at all. Robert and I agree that marketers ought to forget about mapping content to elaborate customer journeys, and discuss what they ought to focus on instead. BuzzFeed makes deal with agency for preferential rates and technology (23:54): WPP media agency network GroupM and BuzzFeed have signed the latest in a series of deals in which agencies and media companies pool their resources. GroupM will get preferential rates, dedicated staffers in BuzzFeed creative studio BuzzFeed Motion Pictures, and exclusive access to BuzzFeed’s proprietary data and analytics platform as part of the year-long global partnership. Robert and I debate several scenarios for how this deal could play out. Ubers are about to start carrying an in-car magazine (31:22): Starting this week in NYC, you can grab a copy of Uber’s new in-car magazine, called Arriving Now, from the seat-back pockets of the vehicle you’re riding in. AdAge speculates that Uber is testing out a content arm through which they can push out cool stories that give people a better brand experience. Robert and I agree this is an excellent opportunity to create a differentiated experience for users of Uber, who are essentially a captive audience during their rides. Joe’s rave: I give a big hat tip to John Cleese, who gave a mesmerizing keynote presentation at Content Marketing World last week. The audience was expecting him to do a comedy routine, but instead he delivered a thoughtful talk on the nature of creativity and how to cultivate it. Robert’s Q&A session with him also provided a lot of value to the audience. I also want to highlight Cleese’s inspired article on national threat levels in Europe, which is hilarious. Robert’s rave: Robert loves the inspiring story of Beth Comstock, who was recently named vice-chairman of General Electric, the first woman to hold this position. Her career has been marked by an unshakable commitment to digital innovation and telling the 137-year-old company’s stories in compelling ways. She’s an awesome example of a marketing executive who has grown her role into a position of leadership, something to which we should all aspire. The Story of Content: CMI’s new documentary, The Story of Content: The Rise of the New Marketing, debuted last week during Content Marketing World. This 43-minute film contains some amazing case studies, including The Furrow from John Deere, Will It Blend? from Blendtec, Proctor & Gamble’s sponsorships of soap operas, and Marcus Sheridan, who changed the fate of River Pools & Spas by taking a content-first approach. 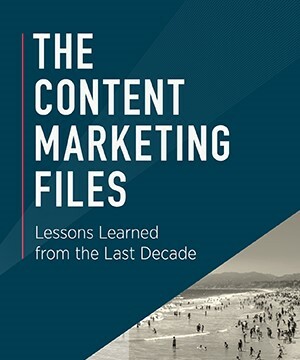 It also contains interviews with content marketing thought leaders like Robert Rose, Jay Baer, Ann Handley, Scott Stratten, and Don Schultz, the father of modern marketing. The Story of Content is informative, inspiring and entertaining. If you have people in your organization who don’t “get” content marketing, have them watch this documentary.